I'm one of the lucky people whose hair gets oily throughout the day. With my fringe I find it needs washed more often so I always like to carry around a trusty can of Batiste Dry Shampoo for emergencies. 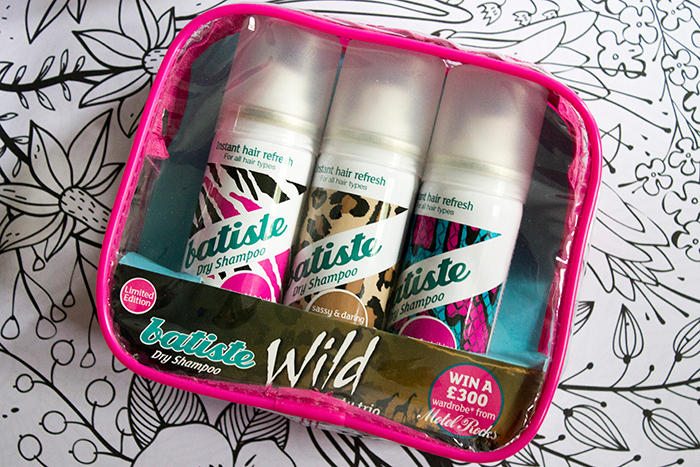 In an attempt to downsize my bag contents, I found that the larger cans were far too bulky and luckily discovered the Batiste Wild Party Trio, a set of three mini dry shampoos. 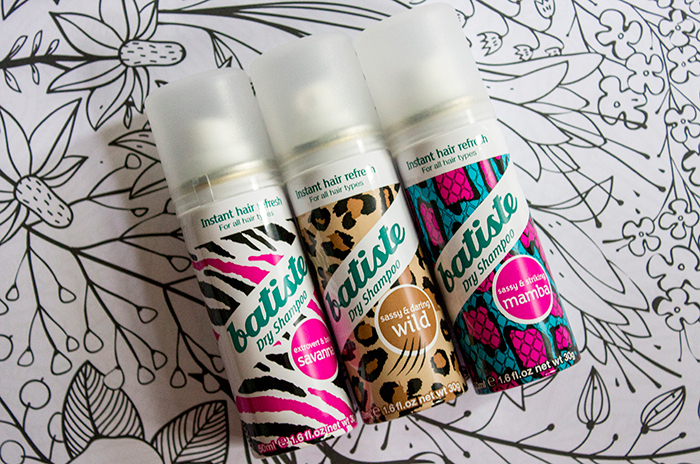 The Batiste Wild Party Trio is a limited edition set featuring three different scents: Savanna, Wild and Mamba in 50ml sizes so they're great for travelling. They're also included in a handly little plastic pouch for easy storage. As the scents are completely new to me (and probably most of you!) I thought I'd give a little review on how they smell. Savanna has a real girly, perfume like scent. I find it a little sweeter than most of the Batiste scents I've tried so if you prefer something feminine you'll love this one. Wild is slightly more musky and almost verging on masculine for me. I'd say it's probably my least favourite out of the range but the scent does seem to die down after a little while. Mamba is the fruity scent out of the trio. I'd say it's not too far off the tropical scent so if you like that then you'll probably like this too. Out of the three I'd say my favourite was definitely Savanna as I prefer the feminine sweet scents. I have also noticed that the dry shampoos seem to be much less chalky than I've previously experienced so they're great if you need a quick touch up throughout the day. I'd just like to point out that the packaging inside does mention a competition with Motel Rocks however, I do believe this competition has passed just to let you know! I think it's a great little set and I'm sure it will be living in my handbag for the foreseeable future.